Cream Puff is a purebred Texel, born August 2007. She was originally purchased from a Texel breeder by a family for their daughter. Daughter is teenager now, pig being ignored, they sought out rescue since piggy is older. 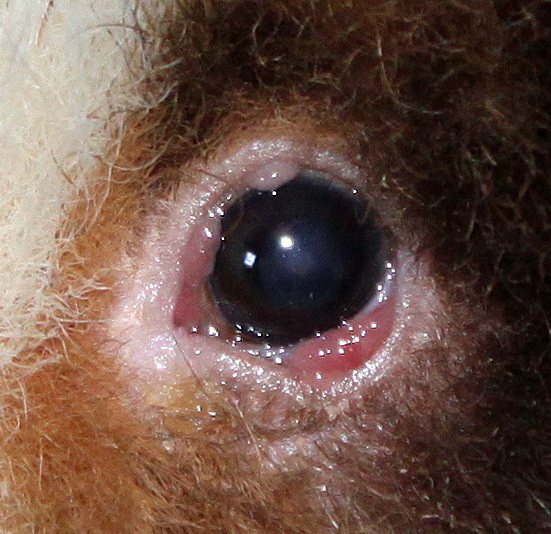 Arrived in Wee Companions rescue April 7, 2012 with this tissue around her left eye, right eye appeared normal. Vet visit on April 10, 2012, determines that eye itself appears fine, the extra tissue is part of the eyelid/area surrounding her eye. He prescribed Ofloxacin Opth. Solution 0.3% (antibiotic), 1 drop twice daily for 10 days, and Flurbiprofen Sodium Ophthalmic Solution 0.03% (anti-inflammatory), 1 drop twice daily for 10 days. These were to be placed in eye approx.. 10 minutes (or more) apart so they would not wash each other out of the eye. During course of treatment, the redness subsided to a pink, but the size of the tissue remain unchanged. After treatment completed, redness came partially back. This condition does not appear to bother her. 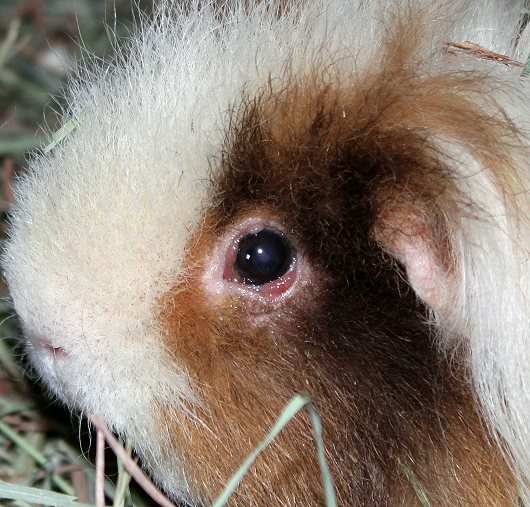 After living as a single pig in a small cage her whole life, she now is happily living as a Wee Companions sanctuary pig in a C&C cage with a herd of other elderly and special needs sows, plus their neutered boar, Valentino.